Remember that Elementary School students with ADHD are easily bored, even by you. Here are several ideas to help ADHD students pay attention to the right thing at the right time. Use peer tutoring whenever possible. Older children to help him, and perhaps allowing him to tutor a younger child. Provide an outline with key concepts or vocabulary prior to lesson presentation. ADHD kids are easily bored, even by you. Try to increase the pace of lesson presentation. Include a variety of activities during each lesson. Use multisensory presentations, but screen audio visual aids to be sure that distractions are kept to a minimum. For example, be sure interesting pictures and or sounds relate directly to the material to be learned. Make lessons brief or break longer presentations into discrete segments. Actively involve the student during the lesson presentation. Have the ADHD student be the instructional aid who is to write key words or ideas on the board. Encourage the students to develop mental images of the concepts or information being presented. Ask them about their images to be sure they are visualizing the key material to be learned. Allow the students to make frequent responses throughout the lesson by using choral responding, frequently calling on many individuals, having the class respond with hand signals. Try role playing activities to act out key concepts, historical events, etc. I have taught ADHD students the history of the Revolutionary War in the parking lot of the school, using cars, trees, and other objects to represent events and places in history. This can work well. Be creative! Yes, it is possible for even you to bore a student. Work at teaching, motivating, and entertaining. The more exciting a subject is to a child, the better he will learn. Be excited about what you are teaching! A small student to teacher ratio enables an increased amount of feedback during prime times of difficulty. Attempt to involve parent volunteers, para-professionals, or support staff in this capacity. Your student will respond better to situations that he finds stimulating and engaging. Varying the instructional medium and pace will help sustain his interest. 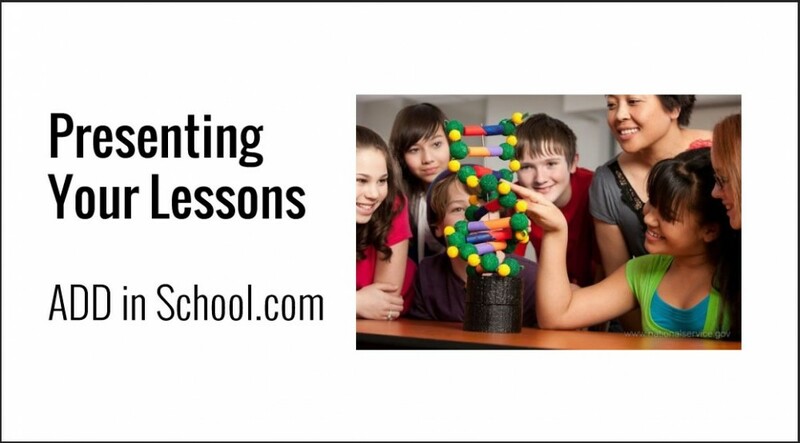 Your student would probably find lessons that emphasize “hands on” activities highly engaging. Keeping the time required for sustained attention on task balanced with more active learning will improve his performance. Use cooperative learning activities, particularly those that assign each child in a group a specific role or piece of information that must be shared with the group. Develop learning stations and clear signals and procedures for how students transition from one center to another. Use game like activities, such as “dictionary scavenger hunts,” to teach appropriate use of reference/resource materials. Interact frequently (verbally and physically) with the student. Use the student’s name in your lesson presentation. Write personal notes to the student about key elements of the lesson. Pair students to check work. Provide peer tutoring to help student’s review concepts. Let ADHD students share recently learned concepts with struggling peer. When presenting a large volume of information on the chalkboard, use colored chalk to emphasize key words or information. Changes in instructor’s voice level and variation in word pacing will also increase his attention during instruction. Make sure that your student establishes eye contact when receiving direction/instruction. This will improve his understanding and follow through on the task. Your student will be more successful when given directions one step at a time. When a series of instructions are given, retention beyond the first direction is difficult. Combine verbal directions with illustrations or demonstrations of the desired task. The use of multiple modes of instruction increases the probability of successful learning of the task. After giving your student directions, have him paraphrase what the teacher has said. This will increase his comprehension and provide an opportunity to check for understanding. Your student may tend to want to be “the first one done” on assignments. Set reasonable accuracy goals with him and collect the entire group’s work at once to reduce time pressures.